Vinu Varghese defined how AT&T could use predictive analytics and cloud computing technologies to optimize operational efficiency in its HVAC equipment. Vinu Varghese, MBA candidate at George Washington University School of Business, worked with AT&T this summer to define how AT&T could reduce its energy consumption and operational expenses while increasing its infrastructure reliability. The goal of the project was to identify target AT&T locations that would maximize cost-benefit value for a five-year project cycle and to quantify benefits. He quantified the benefits of using predictive analytics and cloud computing technologies to optimize the operational efficiency of the building Heating, Ventilation and Air Conditioning (HVAC) equipment. The key hypothesis for this analysis is that monitoring and controlling preventive maintenance of HVAC equipment will reduce reactive maintenance expenses and energy consumption. 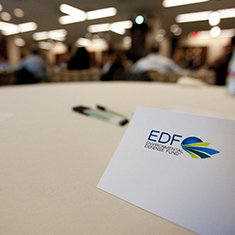 Vinu Varghese, a student at George Washington University, was hired as the 2014 EDF Climate Corps fellow at AT&T.